This is a beginner electronics project so I've decided to add a lot of basic material that will hopefully assist new builders to complete this project. A lot of knowledge that many advanced users take for granted is often left unsaid. I am going to try not to do that here. If you're experienced then all you're going to need is the first couple pages of this article. If you've any questions keep reading and maybe something else I've included here will help you figuring out whatever it is that you do not understand. I am including a schematic of what I am supplying my regulator with as an example circuit. Many variations are possible. I happen to be using 6800uF capacitors for C1 and C2 but anything from 1500uF on up would suffice. The transformer I am using is a 24 Volt center tapped one. Here again you may choose a transformer with a voltage output more suitable for your intended use. I will discuss this part of the project in more detail in step 4. So if you feel you need some more information to build something for yourself you can find some there. The second schematic is what I consider to be the project this article is about, although without something doing what this first section does the regulator board is not useful. 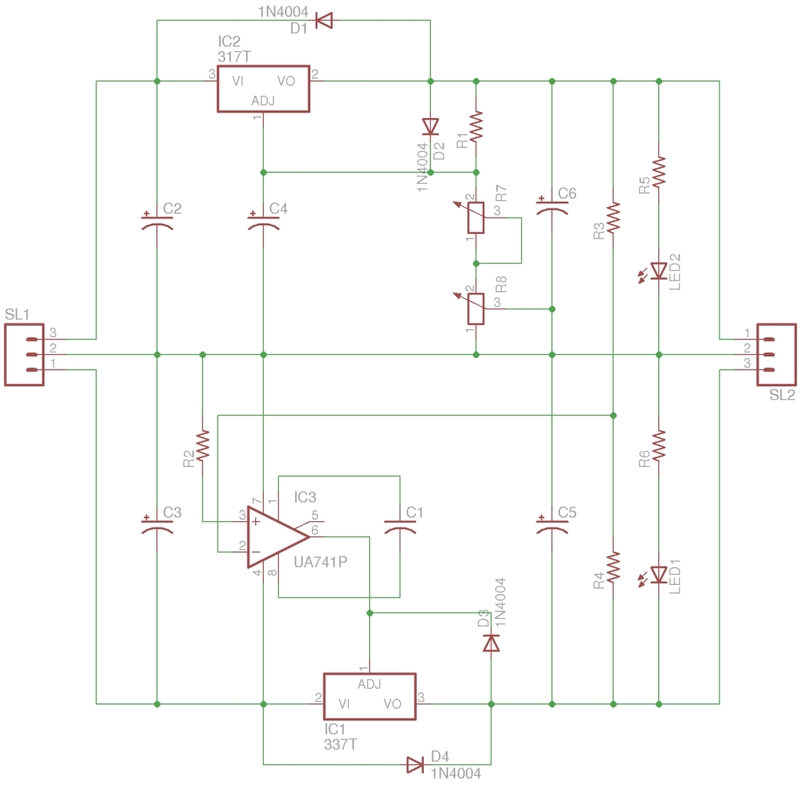 This circuit is so simple it may not even be worth etching. It is certainly simple enough to be a candidate for the print it onto plain paper, paste that onto plain board, and drill build method. When I laid my board out I designed it with using specific heatsinks in mind. You can rotate the LM317voltage regulator and get a cleaner trace pattern on your board. How I laid it out isn't completely horrible and it does work. One thing I'd have liked to have done was to have made my copper lands not as blocky as they came out but I do not know how to do that myself using the software that I have. You can always get creative with a Sharpie marker I suppose. Etching less copper keeps etching solutions from loading up. Or skip etching a board entire like I suggested. The choice is yours. What I am calling the input stage of this project is everything up to the circuit board. That would be the power cord, power switch, fuse, transformer, bridge rectifier, and the filter capacitors. Everything depicted in the first schematic on page 1 of this article which I shall include again here to avoid confusion. Let us consider each component in the power chain in turn beginning with the power cord. Today the choice of a power cord for a project is simple. My project box of choice comes with one built in, a defunct PC power supply. Gut it and you are left with a metal enclosure of handy dimensions and an IEC connector that fits the ubiquitous power cord that I've piles of. Some IEC connectors even have built in fuse holders which satisfies our next requirement. Whatever you do use some kind of a fuse with your plugged in project. How you determine the correct value fuse to use is a combination of factors based mainly on what you have the most of in your fuse hoard. No not really, but use some common sense selecting an appropriate type and size please. Junk power supplies even often contain switches, although I find the ones that typically come on PC PSUs difficult to use so I usually don't bother with them. We all collect switches don't we? I know I've my switch stash complete with those "special" switches waiting for just the right project to use them on. This project only requires a Single Pole Single Throw Switch. Other types are adaptable though. This project needs voltages both above and below ground so a center tapped transformer best satisfies the circuit's requirements. These are not the most common transformer style available. One place you may be able to scare one up is in defunct audio equipment. The general rule here is the higher the wattage output the higher the voltage transformer is in it. So for this project you're going to be looking for something around the 10 watt or less to get voltages in a useful range. Maybe an old boom box that plugged in or a really lousy weak old home stereo has a good transformer in it? One obvious idea that has struck me scavenging for components to pursue my electronics hobby is the fact that I am best off if I look into devices similar to what I am constructing when I am searching for parts along those lines. Like duh! Though I'll admit this thought didn't dawn on me as quickly as it should have. I bring it up now in case it hasn't quite crystallized for others yet either. Getting back to our project if you luckily find yourself the proud new owner of a rotten old stereo that contains donor parts for this project hooray! You may find filter capacitors that are past their prime but still serviceable enough. There should even be diodes or possibly a bridge in there that you can use as well. A word about AC and rectified and filtered DC is in order here though. One thing that surprised me when I first learned it was how voltages rise going through a rectifier, then filter capacitors. It is important to note that if you get a transformer and you measure it to be say 34 volts AC you cannot then say well the regulators can handle 35 volts so I'll be OK. You won't be. You're going to get something more like 45 volts DC out of that after it is filtered and rectified. How is this possible you may ask. Surely the diodes will drop a little voltage and how can the capacitors boost the voltage they get? I think the Keebler elves are partly responsible or this phenomenon but I'm not 100% sure. All I know is it is what it is. Something to do with measured AC being a fraction of its peak to peak power may play some small role in this mystery too. Whatever the cause it is something you should be aware of and watch for as well. It may be a good idea after you assemble this section of the circuit to test and measure its output before you connect it to the regulation board. Better safe than smokey is my motto! This is something I didn't do on this particular power supply but I use it on many others I have built. The utility of connecting a pilot lamp to a power supply this way is twofold. One It gives a visual indication of equipment being on. Something all pilot lights do. Secondly connecting it in the manner I describe bleeds a potentially dangerous charge off the filter capacitors as well, and gives a visual indication while it is doing so too. Then there is the added benefit of the lamp fading after the power is switched off which I find rather appealing personally. But that is just me everyone's tastes differ. In any event consider adding this modification to your supply too. My preferred method for determining the correct value for the Current Limiting Resistor is to simply jumper in a potentiometer temporarily, adjust it from high resistance to where the LED glow looks correct, disconnect the potentiometer from the circuit and measure it's resistance. I'm aware that there are other more "correct" ways of calculating the proper resistance value but hey I'm trying to have fun. Of course it never hurts to have a meter in the circuit in series to monitor the current while doing this. At least then if the LED burns out I might just learn what not to do the next time! Maybe it isn't such a bad idea to measure the voltage and along with the current measurement to calculate the dissipated wattage just to make sure what sort of resistor is needed. A quarter Watt one might not be enough. Ohm says that Amps times Volts equals Watts. If you're a tough guy like me you'll just grab the resistor to see if it is hot or not. Ouch! Usually I prefer my electronics on the cool side if possible. One technique I discovered while I was doing this project was an easy way to cut copper clad printed circuit board. I'd used saws in the past with varying degrees of success to cut PCB board. Cuts never came out too straight for me, and the task was laborious, and detrimental to saw blades as well, especially when cutting fiberglass boards. This time I tried something completely different. I used a hobby knife and a steel straight edge to cut a piece of PCB. The technique I discovered that worked the best was to angle the knife sideways differently in perpendicular relation to the steel straight edge with each pass I made. A bit difficult to describe with words so I made a graphic of what I am trying to impart. Done correctly thin threads of the board material should eventually be freed from within the cut while making a V shaped groove into the board material. Scoring from both sides of the board will ensure a clean break when the board is cut enough so it snaps apart easily. Cut in this manner the board's severed edge comes out very straight, although not perfectly perpendicular to the flat faces of the board. Putting a piece of sandpaper onto a table then sanding the board edge a few times should remedy that if it is important to you. I like doing it this way better than sawing so I figured I'd offer it up as a suggestion to others who may find it works for them as well. How would you connect one filter capacitor in this circuit configuration? This article deals primarily with the circuit on the other side of the bridge, and filter anyways. I pulled those caps out of another PSU that was doing essentially the same thing I'm doing here too. So it is safe to say this is how it is commonly done. I understand that. I didn't see them right away on the Transformer side of the drawing. Hi pfred2. I really enjoy reading your Instructables, You are a wealth of information. I am trying to understand this neg voltage. You have a 24V power supply. +12v to 0. 0 to -12v. If you test between them you get 24v? If so can the 0 to -12v be used to power something all by its self or does it need the +v also? I once built a zapper from a disposable camera and it measured -450v. Had to be i guess, i was measuring from plus of the battery to the ground/out of the zapper. So i am not really clear on this neg voltage. i.e. then the two extremes are rectified into a dc voltage. It does help. Thank you very much for the visual aid. I'll let you look it over to see if I am on the right track or not working on your circuit. I could upload my Eagle file too if that would be of any use. Once you check I've done the schematic right I'll start doing the board art. A question: Is pin 8 of a UA741 connected to anything internally? On a LM741 it doesn't appear to be....assuming an 8 pin DIP. It beats me it is Wayne's board. I'm just trying to route it. I was looking at an LM741 OpAmp and it looks like pin 8 has no internal (IC) connection (I only looked it up because I was kind of familiar with the 741, and it struck me odd that all the pins were used even though I was sure one was kind of useless). The 741 being in there did make routing the board difficult so any pin not connected would make it easier. I'll have to disconnect pin 8 and see what I can come up with. I am thinking that would include pin 1 and the #103 cap also. Yes, now if this were an LM358 or LM324, then you'd of course tie unused outputs to ground for stability. But you probably already are quite familiar with all that. No i didn't know that. Thanks for tell me I went to Electronics school but that was almost 30 years ago. I only recently have really gotten back into it. So most everything i do i have to learn it. For instance this dual rail we have been going over. I only just learned this but it certainly doesn't mean i cant build one. The best project for me is one i have never built before, so i get the excuse to research it to no end and build one. For me the using the item i built is second to the research and building. Al tho i do prefer to see the end result working as opposed to not. So dont hesitate to fill me on the details, i am sure i can use it. You are welcome. There are many electronics gurus on board here at Instructables, many of them MUCH more enlightened then I am. I have only a hobbyist's background in it; never any formal training, but I had at one point some 20 years ago, gotten good enough to build many of my own pieces of (simple) test equipment; which I found quite enjoyable (the fun of putting it together and the ability to use it often afterwards). So, yes, I understand exactly what you mean by how much fun this can all be. I still have yet to learn to use programs like Eagle, etc. As most can tell, I have been using PAINT or GIMP to draw most of my schematics. Well, OK maybe I could have, but it'd have been a lot harder! I use Eagle to show me where each wire goes while I wire the circuit. I pick a trace and it shows me everywhere it is connected to. Why yes it does. Between pin 1 and pin 8 there a 100p cap. It must just be hard to see because when pfred just now sent me the art work for the board the cap is connected correctly. Check the link a few posts down from pfred with the jpg. No, I mean when I look at a pin out for the 741....pin 8 need not be connected to anything as it has no connection inside the IC itself.